This week came the news that Bruno Loubet, the Bordeaux-born chef who worked with Pierre Koffmann at La Tante Claire before running a series of fine dining restaurants in London throughout the 90s, has closed the Grain Store in Kings Cross, his last restaurant in London (if you don't count the one at Gatwick Airport. Which you shouldn't). I've often wondered what the lucky people who ate at places like Bistro Bruno (1993), L'Odeon (1995) or even made the trip to Raymond Blanc's Manoir aux Quat'Saisons in the 1980s (where he was head chef at the time) made of the Grain Store. Loubet was once a very traditional fine-dining French chef, all demi-glace and fillet of beef with foie gras; the Grain Store was an odd departure, largely vegetarian and vegan, pushing things like grilled tenderstem broccoli and carrot and orange smoothies. Ironically, the bits I enjoyed most from the menu at Grain Store were the occasional dishes that involved meat; pigeon seared in the Josper grill, for example, or pork and lamb belly tamales. Fairly or unfairly I assumed that this was really where his heart (and skills) lay as a chef. Much as I admired Grain Store, then, and much as I recognise its importance in the grand scheme of things, you don't win friends with salad. And it's a pleasure to report that the replacement for Loubet's other restaurant, Bistro Bruno Loubet, on the ground floor of the Zetter hotel in Clerkenwell, is an honest-to-goodness belt-and-braces Modern European bistro, full of things like chicken liver parfait, pork belly and dry-aged steak. And if you think shoes like Loubet's are going to be hard to fill, well let me introduce you to chef Ben Boeynaems. I know I'm prone to hyperbole occasionally(!) on this blog, but I honestly can't remember the last time outside of the very finest of fine dining restaurants I've been offered dishes so utterly, seductively beautiful as Ben Boeynaems' at the Zetter. After a tray of good bread and salted butter came this gazpacho, lovingly drizzled with concentric rings of olive oil and cut across with a single long crouton dotted with neat cubes of olive and tomato. In the center, a miniature bouquet of cherry tomatoes and a sprig of micro basil. All of which astonishing artistry would mean nothing, of course, if it didn't perform on the tastebuds but fortunately it more than qualified on that front too - silky and herby and full of summer flavour. Asparagus with "crispy hens egg" was in its own way just as attractive. Bright green spears of asparagus, draped with wispy sheets of ham, lay next to a perfectly soft-boiled egg, coated in a thin layer of breadcrumbs. Yes, ham egg and asparagus isn't a revolutionary combination, but it's a great one, and when created with as much care and technical skill as this, is unbeatable. Doesn't it just look incredible? Chicken liver parfait had been made under a delicate dome of spun sugar and was - again - beautiful. The parfait was dense and meaty, lifted with a touch (I think) of alcohol and luxuriantly textured. Toasted brioche was similarly accomplished, soft inside and gently sweet. An in-between course of miniature surf'n'turf - steak tartare and anchovy - was as exquisitely presented as everything else and a fine show of technical ability. I think if you can't enjoy steak, gently loosened with mayonnaise and capers, topped with a crunchy nugget of deep-fried anchovy, well then there's no hope for you. Mains continued to draw gasps. If you've ever seen a better looking fillet of cod than this, with its golden crust, gleaming white flesh and bed of sea plants and mussels, then you're either very lucky or a liar. The fish fell apart into clean, defined flakes and the seafood-butter sauce bound the salty seaweed and sea aster together. It was pretty much a perfect cod dish, utterly faultless. Pea and broad bean risotto, vibrantly green and lit with bright chunks of sheeps' curd, contained excellent al-dente rice and generous shavings of strong summer truffle. It tasted great too, of course. But I mean, just look at it. Dark chocolate mousse came teased into another geometrically-exact dome, surrounded by a swoop of granola-dotted chocolate like one of the rings of Saturn. And finally lemon posset, made from Amalfi lemons no less, topped with summer berry compote and crossed with two warm doughnut sticks. Just like everything that had come before, it was beautiful inside and out. There's a part of me wishes there at been at least something to complain about during our evening at the Zetter, because such gushing praise about a relatively unknown chef, new to his job and with a bill picked up by the PR company, could quite rightly raise eyebrows. But I hope you can tell from the photos at least that such praise isn't misplaced, or even exaggerated. And while you'll have to take my word that it all tasted as good as it looked, at the prices they're charging the public (starters are £5-£9, mains £14-24) they shouldn't be too far out of anyone's budget if you wanted to try it yourself. £17 for that incredible bit of cod; £6.50 for that dome of chicken liver parfait. It's all amazing value. Anyway, if I haven't convinced you by now I never will. Thank you, Zetter hotel, for the meal (obviously) as well as the night in your lovely rooftop garden rooms, and congratulations for somehow managing to find a chef to not only adequately fill the vacuum left by one of London's most famous chefs but in a few short weeks almost eclipse him. It's a real achievement. This grand old Clerkenwell hotel has reinvented itself - again - with one of the most exciting new bistros in town, and the future looks bright. I was invited to eat at Club Zetter and to spend a night in their Deluxe Rooftop Suite. The bill with drinks would have been about £45/head, and the Rooftop Suite is available from £405/night. Offers available on their website. It's a sign of how good Darjeeling Express is, and how great its draw to hungry Londoners, that despite its off-the-beaten-track location on the 3rd floor of a rather soulless food/shopping mall, they were turning people away for the walk-in tables for the duration of the time I was there. For anywhere in the super-competitive Soho restaurant scene this is impressive; for somewhere barely a month old, well, clearly something pretty special is going on. Of course "barely a month old" doesn't quite tell the whole story. Asma Khan has been cooking her own brand of multi-regional Indian cuisine for a number of years now, first at a supper club in her own house and later at a short-lived (but wildly popular) popup at the Sun and 13 Cantons in Soho. I loved it then, both the unusual dishes that took inspiration from Calcutta to the Himalayas, and service from Asma herself who is as good as ambassador for her food and Indian food in particular as any flashy PR firm. And I love it now, settled into this bright spot overlooking the Kingly Court central courtyard and serving a short and irresistably attractive menu of highlights from her Sun and 13 Cantons stint as well as a few fascinating new bits and pieces. First to arrive were the puchkas, which you may have seen elsewhere called things like gol guppas (Gymkhana) or dahi puri (Masala Zone and elsewhere) - little puff pastry casings full of chick peas and potato, into which you pour tamarind water then attempt to swallow the whole lot before the pastry soaks through and collapses. They're as fun as they are tasty, with an addictive set of textures and seductively spiced. Tangra chilli garlic prawns were nothing short of brilliant - the bounce and fleshiness of the absolute finest fresh seafood (I'm not going to risk declaring they were cooked from live, but they certainly tasted like it), in that slick, salty way that seemingly only the very best Chinese kitchens can achieve, matched with a tantalising note of Indian spices. Tangra is apparently Calcutta's Chinatown, and the Indo-Chinese flavours here are a deliberate tribute to that part of the city. I'm happy to report that the old Sun & 13 Cantons dishes have lost none of their charm or impact. Lamb samosas are still amongst the best in town, packed full of top quality lamb and presented with marvellous dippings sauces - coriander, tamarind and chilli. Is there a part of me prepared to admit I prefer the thick, chocolately black dal than the thinner, lighter yellow (Hyderabadi Tamarind) dal? Well yes, probably, but once you'd got used to the idea of thinking about it more like a soup than a side then it was still very enjoyable, rich and smooth with a nice kick of smoked chilli. More prawns, with the same beautiful fresh texture but this time in a Bengali sauce of spiced coconut milk. Darjeeling Express really do a very good line in prawns - either they've found a great supplier or just don't overcook them like most other kitchens in London. Or both. Venison kofta had a nice loose texture and came in a powerful tomato/chilli sauce. It's probably worth mentioning the tableware at this point too - the irregular shaped bowls give everything a nice organic aesthetic. "Hyderabadi mirchi ka saalan" was a kind of onion/chilli stew made with ground peanuts and sesame, and tasted far nicer than its grey complexion would suggest. It was a sesame salad back in their Soho incarnation that made me realise how much more there was to Indian food than I had previously discovered - this was another genuinely unusual dish. At least, to me. Methi chicken was perhaps the most "high street" of the Darjeeling Express mains, but lifted itself from the completely ordinary thanks to good moist chunks of chicken thighs and a nice light tomato sauce. All of the sauces, in fact, were excellent - I highly recommend at least a bowl of rice to soak up any leftovers, and indeed a few slices of the house roti to polish off any chilli/coriander/tamarind dips that may still be hanging around. Dessert was a huge bowl of "bhapa doi", a kind of sugary yoghurt mixture that normally comes in a more sensible portion size; Asma gave us the entire batch "just so we can see what it looks like". It looked, and tasted, great, so much so I don't want to tell you how much of this insane amount we ate between the three of us. Because none of us are proud of it. Clearly, then, nobody would have much to complain about at Darjeeling Express with regards to the quality of the cooking. Just like in the popup in Soho, all the food is considered, crafted and carefully presented, lovingly researched and bursting with flavour. The influences are as varied and exciting as the woman behind them, taking cues Chinese and Himalayan cuisines and introducing them in accessible and enjoyable ways. When it comes to what's on the plate, Darjeeling Express is near-faultless. Unfortunately we live in a world of rents, overheads and staff shortages, and in the move from a borrowed space in a pub in Soho to a proper, big, mature restaurant some things have necessarily had to change. 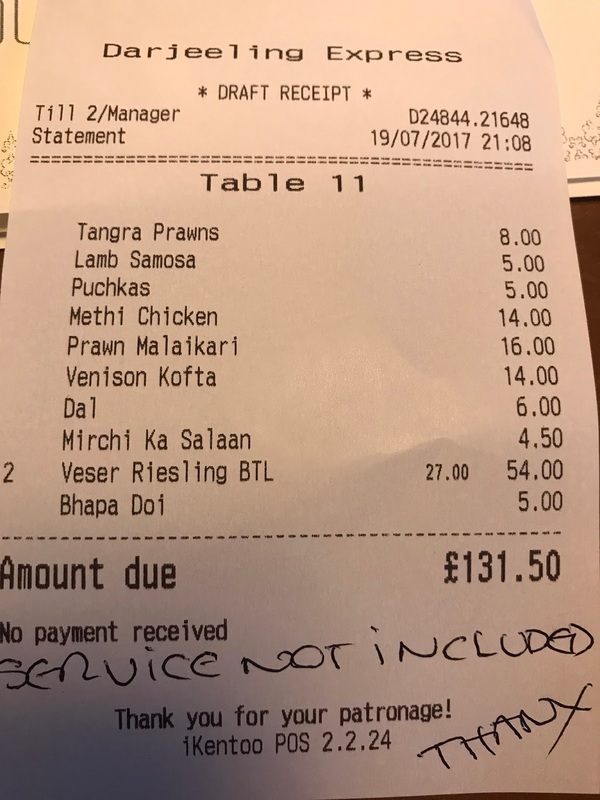 If you want good food you have to pay for it anywhere, of course, but I wonder if £14 for five meatballs or £16 for five prawns (I think, apologies if I'm wrong on these numbers) could be quite a hard sell to a non-foodie customer base used to paying a lot less for their curry. 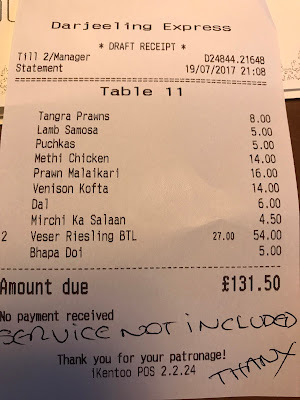 And if you're going to leave the service charge off by default (which is entirely up to them of course, though I wouldn't recommend it), please don't have your staff handwrite cheery "SERVICE NOT INCLUDED! THANK YOU!" messages on the paper bill, it just looks needy. But you know what, niggles aside this is still a lovely place to eat, and I'll certainly be back. So maybe that's all you need to know. Asma Khan is a singular force in London food, forging her own path, singlehandedly creating her own brand of Indian-fusion cuisine (with help from an all-female kitchen team, of course) and ending up with an idiosyncratic and characterful restaurant in a city that thought it had seen everything. For sheer audacity alone it's worth a visit; the food is just a wonderful bonus. There's nowhere quite like the Darjeeling Express. Nine times out of ten if you asked any dedicated foodie scenester waiting at platform 13 at St Pancras late morning for the Javelin train where they were headed for lunch, they'd give the same answer - The Sportsman. Stephen Harris' pub on the coast near Faversham has over the last few years become something approaching a restaurant mecca; strictly seasonal food, cooked with care and presented with style, it is the platonic ideal of the gastropub and one dish in particular - slipsole in seaweed butter - is the star of a thousand Instagrams. You should go, as well, if you haven't yet. It's bloody fantastic. But on this particular Saturday morning, we'd decided to give another star of Kent a try. Canterbury is worth visiting even if you weren't very hungry (I particularly recommend a walk around St. Martin's church, built an astonishing 1,400 years ago and still standing), but we had a reservation at the Good's Shed, handily located right next to the station so as not to lose valuable eating and drinking time. Opened as an indoor farmers' market back in 2002, the Goods Shed has avoided the pitfalls of so many of these kinds of places by actually feeling like a real, normal, every day food market instead of one of those middle-class theme parks selling hand-painted tableware and bowls of olives. The restaurant, occupying a bright mezzanine level overlooking the bustle of the market below, feels similarly grounded, boasting huge wooden tables generously spaced apart, and is the kind of place you'd happily spend an entire afternoon. So we did. Lunch began with weeny soft-boiled quail's eggs dipped in an interesting salt/spice mix containing dried chilli and fennel seeds. House bread - foccacia I think - was nice and salty and came with a bright, creamy butter. It was also free, which was a nice touch. Mussels in a white wine, cream and tarragon sauce is a time-honoured recipe and one that still has the ability to soothe, comfort and satisfy. Perhaps there was a tad too much garlic into the mix, but that could just be a matter of personal taste. Artichoke broth was, for what I'm guessing was a completely vegan dish, fairly impressive. Of course, as a committed meat-eater it goes without saying I would have preferred a chicken stock base, but the huge chunks of artichoke had a nice bite and the rest of the veg had bags of flavour. A third starter had huge, soft chunks of slow-cooked ox cheek, but the surprise star of this dish were the carrots, which were startlingly sweet and densely-flavoured. Clearly the Goods Shed benefits hugely from its trade with local farmers - the range and quality of produce both in the restaurant and on the shelves below is really something. But while the starters had been decent, the mains were genuinely excellent. My own guinea fowl boasted a beautiful golden, herb-enriched crust and a cider sauce with a perfect balance of alcholic tang and meaty richness. The slices of black pudding were a bit odd - quite sour and with a strange uniform texture - but the Lyonnaise potatoes were soft and creamy, leaves of chard soaked up that sweet/sour cider sauce like a sponge, and the bird itself was bright and bouncy. The only notable problem with this lamb main was simply that there was too much of it. There were so many generous slabs of lamb, and they were so expertly rendered with their perfect pink flesh and salt/herb crust, that it felt criminal leaving any. A barley, grilled courgette and herb salad underneath made further excellent use of market vegetables, and aioli was light and sharp. The last of the mains, hake with fish croquette and clams, showed more technical expertise - look at the crisp skin on that fish, and the beautiful bright-white flesh - and more judicious use of seasonal vegetables (chard again). You could hardly want for a better way to eat hake. The dessert menu at the Goods Shed reads like a dream - a poem of seasonal fruits and luxurious sweet continental wines. Unfortunately the first item from it that arrived was a rather mundane cheeseboard; a couple of OK blues and a soft goat's that I'm pretty sure you can buy at Tesco's. Still, the fruit bread and chutney was nice. Why the cheese selection was so half-hearted I can't work out, especially as there's what looks like a pretty competent cheesemakers (Cheese Makers of Canterbury) set up in the very same room. Fortunately, the desserts more than made up for the disappointing cheese. Gooseberry and custard tart was a thing of intense joy, an ethereally-light custard cradling tangy stewed gooseberry. On the side, unpasteurised creme fraiche, rich in dairy with a faintly earthy, smoky note, a perfect foil to the fruit. ...and finally chocolate mousse was so light and fluffy it was practically thick chocolate milkshake, studded with fresh raspberries. So, not all journeys to Kent need to end at the Sportsman. 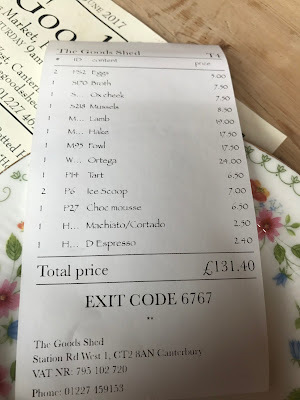 The Goods Shed almost makes as good a case for a day out in Canterbury as to Faversham, and though obviously not quite on a par with Stephen Harris' place - where is? - this charming building, bristling with activity and wonderful produce, is a triumph for all kinds of different reasons at once. The restaurant is a hymn to seasonal British food, cooking Kent's finest produce sensitively and generously, serving it with charm and style, and anything you particularly fall in love with during lunch you can pick up in the market below and take home with you. Enjoying yourself here, if you have a heart and an appetite, is something approaching an absolute certainty. I'd say that was worth jumping on the Javelin for, don't you? Nestled in a sleepy East Yorkshire hamlet, surrounded by acres of beautiful countryside, and blessed with a kitchen garden groaning with vegetables, berries and herbs, the Pipe and Glass would seem, on the face of it, to have everything going for it. And it's certainly the case that its achievements, such as they are, have hardly gone unrewarded - there's the Michelin star (held for the last 7 years running), the AA rosettes, the regular top-ten placing on top gastropub lists. My enjoying a meal there was, as far as it's generally possible to be, a Sure Thing - occasionally Michelin can be wrong, occasionally these top gastropub lists can be nonsense, but for everyone to be wrong at once would require quite the conspiracy. And yet here we are. It's not that I hated my meal at the Pipe and Glass - I enjoyed bits of it very much - but there wasn't quite enough of it going right to settle the nerves and too many things to grumble about to ignore. The Curate's Egg analogy doesn't really apply to restaurants - it is, after all, possible for a single dish to be a complete disaster without ruining the whole meal - so for an evening in a critically-lauded gastropub in an idyllic part of the country to go badly (or at least worse-than-average) requires problems in a variety of areas. Beginning with service in the bar. Given there were a grand total of two parties in the room, you would have thought the whole business of asking what we wanted then bringing it wouldn't have been beyond the abilities of the person assigned to the task. But maybe our waiter was having a bad day, or maybe he just didn't want to be there, because we spent a very long time waiting to be offered anything, and managed to get hold of a round of drinks just seconds before a different member of staff came over to usher us to our table before we'd managed to take a single sip. Nibbles did appear, though - watermelon and feta kebabs, covered in sesame seeds. They were nice enough. We'd ordered food with the drinks, and were somewhat surprised to be presented with our starters less than a minute after taking our table in the dining room. Being given food too quickly isn't usually too much of a problem - I'd rather that than have to wait - but nobody likes to feel rushed. My own was a rather bizarre arrangement of sliced pickled carrots - rolled and balanced upright like orange chimneys - in between slivers of crab crackers, on a bed of white crab meat, herbs, flowers and God knows what else. The issues with this dish applied to a large number of the dishes we ate - way too many ingredients, a naff presentation involving too many showoffy techniques, leading to a confusing, unbalanced whole. The pickles were all you could really taste, the crab meat was buried, and it was covered in so many random bits and pieces from the garden (fennel tops, coriander, flowers) that it just looked ridiculous. I'm afraid my pictures of the other starters didn't come out - it was dark on that side on the table - but all suffered from the same glut of ingredients and confusion of flavours. "Courgette three ways" came with so many flowers and sprigs of herbs and blobs of this and that (plus a deep-fried whole egg with its own ceramic bird foot stand) the main ingredient was completely lost, and "Marinaded Heritage tomato, avocado and burrata" was (thanks largely to a "spiced gazpacho granita" hiding somewhere underneath) cold, wet, and boring. House bread came in two forms, one of which was tomato and lovage, and both were fine if a little insubstantial in texture. My main contained turbot, red pepper relish, fennel croquette, lobster, dill oil, lobster bisque, more fennel, fennel tops and the kitchen sink (probably). Frustratingly, some of the individual bits were generally cooked quite well - the turbot was lovely - but the fennel was presumably chosen because they had it, not because it ate well (it was chewy), the red pepper relish battered everything, particurly the subtle-to-the-point-of-non-existent bisque - into submission, and the fennel croquette added nothing other than another level of textural confusion. Other mains fared slightly better. Again, no photos sorry but "Breast of free-range chicken, tarragon forcemeat, summer truffled peas, gem lettuce, girolle mushrooms and crispy pancetta" got a pass thanks to a fantastic brined flavour in the chicken and bags of fresh summer truffle, and "Yorkshire gin and beetroot-cured sea trout, pickled cucumber, nasturtiums, lindisfarne oyster fritter" involved a genuinely interesting way with cured trout and a lovely fried oyster, even if it - again - could have done with having a few ingredients culled. So far so bewildering, and it's safe to say once the main courses were cleared away we were wondering what could possibly be in store for dessert. Maybe some attempt at Can Roca's famous "Anarchy 2003" dessert involving 50 or more separate elements? I'm happy to report, though, that my "Raspberry and pistachio delice" with raspberry sorbet and aerated white chocolate was cleanly presented, clear in form and function and tasted great - presumably in part thanks to the use of some fresh garden raspberries we'd seen growing out back. There was also an opportunity to try a lovely example of Yorkshire Blue cheese. I don't know whether I've ever really tried one this well kept before or maybe just forgotten, but this was a beautiful thing - soft, creamy, and with just enough blue tang. The fruit loaf it came with was pretty good too. So yes, there were some things to like, here and there, but in the end our meal at the Pipe and Glass was just not good enough. Service settled down a bit over the course of the evening but they did seem to have an aversion to clearing empty glasses and never really approached an attitude described as "friendly". Dishes were, in the main, ugly, overthought and contained way too many ingredients; it's often said that a great chef will make a dish then remove one element to perfect it - in the case of the Pipe & Glass in most cases they could lose about half. And the same accusation of indecisiveness could be made of the menu as a whole - ten starters, ten mains, seven sides and eight desserts, all quite pricey, attempting to impress with size and spectacle rather than flavour and refinement. It was all just a bit... much. Still, at least we'll have that dessert. And it would be tragic situation indeed if we were to regret entirely a journey to this most spectacular part of the world and a pretty gastropub with a kitchen garden and (very nice actually) rooms with rainforest showers. It's just that next time, if I'm in East Yorkshire I may find myself returning to the glorious Black Swan in Oldstead, altogether a better way of spending £55 per head on a pub with a kitchen garden. And I recommend you do the same.